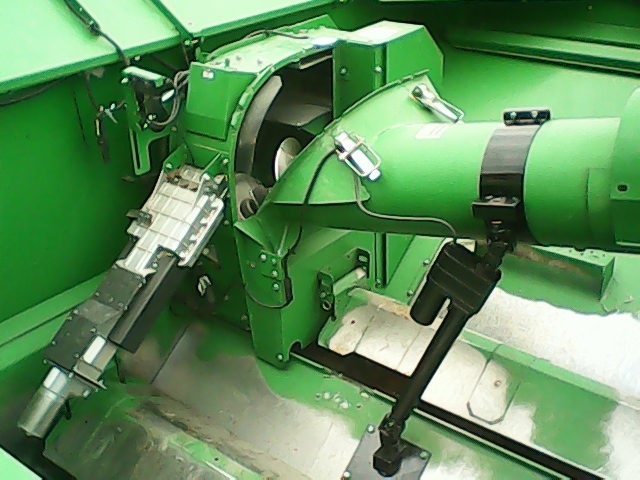 The combine power fold auger kit that you’ve been asking for is finally here! No more climbing up the back of the combine, over the engine, and into the slippery grain tank, every time you need to fold the fountain auger up or down. You no longer have to take the risk of falling and hurting yourself while climbing up and down, or slipping on the grain that’s still in the grain tank. It’s just NOT worth it! The PWR EZ SYSTEMS, power fold auger, is operated right from the comfort and safety of the operator’s seat. And, you have full view of what’s going on while raising and lowering the auger just by looking out the rear cab window. The interference that could happen with the drive hubs has been overcome by replacing the top auger bearing with a hex ID bearing, spacer, and a hex stub shaft, that allow the auger to move up far enough so that the two drives do not interfer with each other, but is still held in place on the drive pilot. All the parts are included in the kit. We have witnessed some very dangerous situations over the years while working for other farmers in the area, and the hazards associated with farming are staggering. We believe that this one attachment can and will save lives, and we have worked tirelessly over the last 8 years to come up with a solution that will make folding this auger safer. The kit comes in two configurations that will fit almost all John Deere STS combines, for North America, built since model year 2000, with a manual fold fountain auger. All kits are complete with all of the components to fully work. All mounting brackets, wiring harness, switches, actuator, hardware, and instructions, are included. The unit can be installed in approx. 3 – 4 hours. Included in the kit is a safety system that lets you know if you forgot to fold the auger back up before you start to harvest again. And you know what can happen if you forget – it can get very expensive!